In a report on geolocation services and privacy concerns, reporter Amy Harmon quotes Calit2 director Larry Smarr as saying "we are moving into a world where your location is going to be known at all times by some electronic device... It's inevitable. So we should be talking about its consequences before it's too late." In its Oceans and Earth column, writer Robert Monroe discusses the importance of supporting students in the UC system, and highlights the work of Scripps Institution of Oceanography student Jessica Lundquist, who "this week won the Desert Research Institute's Peter B. Wagner Memorial Award for Women in Atmospheric Sciences, which encourages the endeavors of female graduate students." Lundquist has been a Calit2 Graduate Fellow for the past two years, and won the award for authoring a paper on the Sierra Nevada's "synchronous spring" phenomenon." Personal technology writer Jonathan Sidener talks to Calit2 director Larry Smarr about the future of supercomputing and the "Gigabit or Bust" initiative. He also asks whether the technology economy in San Diego will ever escape the shadow of Los Angeles and Silicon Valley, and Smarr replies: "I think it's just the opposite. Silicon Valley is going through a crisis of confidence... San Diego is where San Jose was in 1980. We're just at the start of building a wireless world, and San Diego is a leading center of wireless. I look to San Diego as being the future." In its Dec. 11 special report on science and technology in San Diego, contributing editor Ken Howard spoke with Calit2 director Larry Smarr and other local scientists, engineers, CEOs and policymakers. "San Diego is facing significant challenges to its future development," he writes. "How do the some of the region's leading lights think it will cope?" The newspaper reports that FCC chairman Michael Powell discuss issues affecting the telecom industry at a public conversation with CSE professor and Calit2 director Larry Smarr, and Peter Cowhey, dean of UCSD's School of International Relations and Pacific Studies. The event will take place at 11 a.m. Tuesday, Dec. 9. Later, Powell is expected to tour Pala, Rincon and San Pasqual Indian reservations to see how technology is being implemented. In the December-January issue, the magazine's "Prototype" section reports on the success of Jacobs School professor Henrik Wann Jensen and Ron Fedkiw of Stanford University, in developing software that creates realistic animations of fire. Reports the magazine: "The software solves equations that describe swirling fluids, expanding gases, and vaporized fuel, and renders effects like smoke, soot, and objects igniting. It takes about five minutes to generate each frame, but filmmakers and special-effects companies are interested." Jensen is affiliated with Calit2. Researchers building a new type of Grid computing environment known as the OptIPuter have agreed to deploy BigBangwidth's next-generation lightpath technology. 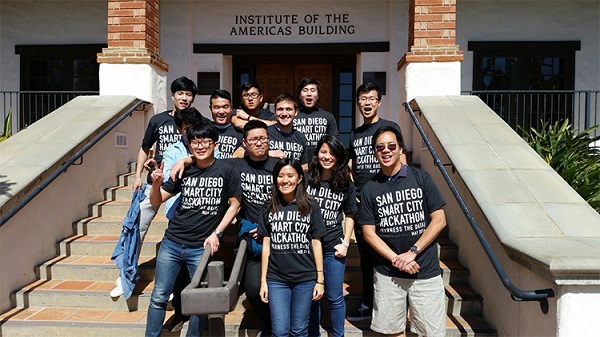 The system will be installed at the University of California-San Diego (UCSD), and will act as an on-ramp for large data streams from high-performance workstations connected to packet-switched networks. HPCwire Assistant Editor Tim Curns' interview with Larry Smarr of Calit2 concerning his impressions of SC2003 and the future of supercomputing. At the SC2003 conference last week, the winners of the Gordon Bell Prizes, the HPC Challenge, and the best research papers and poster were announced. The conference itself gives awards for Best Paper, Best Student Paper, Best Poster, and the HPC Challenge and Bandwidth Challenge. In addition, SC2003 serves as the venue for presenting the Gordon Bell Prizes, which reward practical uses of high-performance computers, including best performance of an application and best achievement in cost-performance. Additionally, two special awards are presented by the Institute for Electrical and Electronic Engineers (IEEE) to recognize longtime innovators in high-performance computing. HPCwire Editor-in-Chief Alan Beck's interview with Maxine Brown, of the Electronic Visualization Laboratory at the University of Illinois-Chicago and project manager of the OptIPuter project. OptIPuter software architect Andrew Chien talks about how BigBangwidth's technology fits into the project, in a Q&A with HPCwire at Supercomputing 2003. In the Nov. 18 edition of its online Daily Business Report, the magazine reports on the agreement to deploy the technology of Canada's BigBangwidth as part of the OptIPuter grid networking architecture on the UCSD campus. Calit2 director Larry Smarr and fellow Jacobs School computer science and engineering professor Andrew Chien are quoted. According to the article, BigBangwidth's Lightpath Accelerator system "will act as an on-ramp for large data streams from high-performance workstations connected to packet-switched networks." Researchers building a new type of Grid computing environment known as the OptIPuter have agreed to deploy BigBangwidth's next-generation lightpath technology. The system will be installed at the University of California, San Diego (UCSD), and will act as an on-ramp for large data streams from high-performance workstations connected to packet-switched networks. In its December-January issue, the magazine's 'Prototype' section profiles the work of Jacobs School professor and Calit2 layer leader Mohan Trivedi in developing "a tool that keeps an eye on the driver to make sure his or her eyes are on the road," to reduce the chances of an accident due to drowsiness or lack of attention. Notes the article: "The researchers have so far installed the prototype system in two experimental vehicles and are now testing it to see if it can detect where a car is in relation to lane markers and alert the driver if the car is unintentionally drifting out of the lane. They have recently filed a patent on the technology. Celia Pearce, Research and External Relations Manager for the New Media Arts Layer of Calit2, said gaming has become part of mainstream society. Gaming "is still in a growth curve," Pearce said. "It is the only sector of the (information technology) industry that has continued on an unslowed growth curve since the IT bust. It has kind of been recession-proof. The high-performance computing news service reports that intitute director Larry Smarr, Jacobs School dean Frieder Seible and co-PIs on the OptIPuter will be among those talking to Supercomputing 2003 in Phoenix, AZ, the week of Nov. 15-21.
wiCalit2 director Larry Smarr talks about the future of the Internet and the impact of Gigabit-scale networking on higher education, in wide-ranging 10-page interview with the journal Educause Review. For the publication's November-December issue, on newsstands this week, California State University senior research associate Steven Daigle visited Smarr to hear about a variety of projects now underway on the campus of UCSD and its partner institution in Calit2, UC Irvine. The result: a Q&A titled "Add Another Zero: An Interview with Larry Smarr. In its Nov. 3 edition, the trade publication's Chappell Brown reports that renewed scrutiny of a statistical technique used by British intelligence to decode German military communications during World War II has opened new avenues in statistical prediction that researchers say could improve machine-learning software. "Recent work by Alon Orlitsky and his colleagues at the University of California-San Diego's Department of Electrical Engineering, has yielded a statistical estimator that the researchers say is more accurate than Good-Turing over time," the paper reports. Orlitsky is an academic participant in Calit2. Glimmerglass and the Electronic Visualization Laboratory (EVL) at the University of Illinois at Chicago (UIC) have signed a partnership to support the development of a new class of compute-intensive applications running on high-performance computers configured into Grids that are interconnected with fiber-optic links. Glimmerglass is providing a System 300E Layer 1 Fiber Switch configured with Photonic Multicasting to EVL, and the partners are collaborating on Grid-related application research, proofs of concept, technical publications, and presentations. Joseph Selim writes in the November 2003 issue of the magazine that "two bioinformatics researchers from the University of California at San Diego have pulled the rug out from under a central tenet of evolution—that mutations appear at random in different parts of our DNA." Jacobs School computer science and engineering professor Pavel Pevzner is quoted as saying "it's like having earthquake fault lines running through your DNA." Science writer Bruce Lieberman reports that UCSD and the VA San Diego Healthcare System landed a "$4.1 million federal grant to transform th eway emergency crews respond to terrorist attacks and other disasters." He quotes Calit2 division director Ramesh Rao on how the telecommunications technology would work. Technology writer Brad Fikes reports on a project called "Assembling the Tree of Life," a consortium of 13 universities, including UCSD, awarded $4.1 million last month from the NSF. At UCSD, the project is directed by SDSC director and CSE professor Francine Berman, who is quoted as saying "we're mapping the history of life on Earth. Another way to think of this is a molecular version of fossil collecting." The weekly reports that UC president Robert Dynes named Calit2 director Larry Smarr and 16 others to a committee of UC regents, faculty, staff, students, alumni and community members, "to advise him in the search for the next chancellor of UCSD." Dynes himself stepped down from that position before assuming the UC presidency on Oct. 2. Eleanor Yang reports that a panel of regents, faculty, staff and a student was named to advise UC President Robert Dynes on the search for UCSD's next chancellor. The panel includes "Professor Larry Smarr, director of the California Institute for Telecommunications and Information Technology and professor of computer science and engineering at UCSD." In an article from UbiComp 2003, a ubiquitous-computing conference in Seattle, Mark Baard reports on the ActiveCampus project at UCSD, "which seeks to augment human interactions with location and activity awareness, factors seen by many as essential to the success of large-scale ubiquitous-computing deployments." He quotes project leader [and Calit2 layer leader at UCSD] Bill Griswold as saying that "if we're ever going to take computing out of the lab and the back office... we'll need to make it friendly, not obtrusive. The test should be what makes people happiest." Writer Mike Allen reports that "Sony has announced plans to give $12,000 worth of camcorders to UCSD -- specifically to the education section of the California Institute for Telecommunications and Information Technology." The equipment will be used by students and faculty at UCSD's Sixth College.